Lakshminarayanan Shankar (born April 26, 1950), also known as L. Shankar, Shankar or Shenkar, is a violinist, vocalist and composer. Early life L. Shankar was born in Madras, Tamil Nadu. Growing up in Jaffna, Ceylon, where his father V. Lakshminarayan was a professor at the Jaffna College of Music, Shankar was exposed to Carnatic music and other styles from an early age. His father was an esteemed violinist, his mother L.
L. Shankar was born in Madras, Tamil Nadu. Growing up in Jaffna, Ceylon, where his father V. Lakshminarayan was a professor at the Jaffna College of Music, Shankar was exposed to Carnatic music and other styles from an early age. His father was an esteemed violinist, his mother L. Seethalakshmi played the veena and all his five older siblings were also proficient in music. The most well known of his brothers is another acclaimed and renowned violinist - L. Subramaniam, who has recorded a number of records himself; another brother, L. Vaidyanathan was a music composer for Indian films. Shankar cites his family and Ty?gar?ja as early inspirations. Shankar began singing at the age of two, playing violin at the age of five, and learning to play drums at seven. At the age of seven L. Shankar gave his first public concert, at the Nallur Kandaswamy temple. He gained considerable reputation in his early youth as an accompanist to some of the most eminent names in Carnatic music such as Semmangudi Srinivasa Iyer, Chembai Vaithyanatha Baghavatar, Palghat Mani Iyer and Alathur Srinivasa Iyer. Following the ethnic riots in Sri Lanka in the 1950s his family escaped to India. After obtaining a Bachelor's degree in Physics in India, Shankar moved to America in 1969 and earned a doctorate in ethnomusicology at Wesleyan University. Here he met jazz musicians Ornette Coleman, Jimmy Garrison, and John McLaughlin while working as a teaching assistant and concert master of the University Chamber Orchestra. In 1975 Shankar and McLaughlin founded Shakti, a pioneering, groundbreaking and highly influential east-meets-west collaboration, with a fluid sound that managed to successfully combine seemingly incompatible traditions. His first solo album, Touch Me There, was produced by Frank Zappa in 1979. Shankar founded his own band - The Epidemics, in 1982, with the composer Caroline. He released three albums with the band. During the 1980s, Shankar recorded periodically as a leader, doing both jazz-based material and Indian classical music. 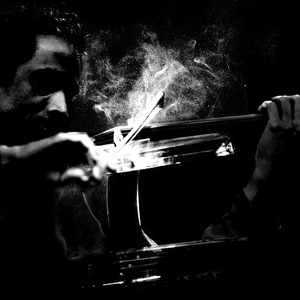 His 1980 release of the album Who's to Know on ECM introduced the unique sound of his own invention, the ten-string, stereophonic double violin. This instrument, designed by Shankar and built by noted guitar maker Ken Parker, covers the entire orchestral range, including double bass, cello, viola and violin. He has recently developed a newer version of his instrument which is much lighter than the original. 1990 saw Shankar co-producing a one hour film directed by H. O. Nazareth, which went on to be nominated for Best Documentary film at the Cannes film festival. Shankar worked on the score of the film The Last Temptation of Christ (1988),composed by Peter Gabriel, with his music ending up on both albums of the score - Passion: Music for The Last Temptation of Christ and Passion - Sources. He won a Grammy for his work on the latter in 1994. 1996 saw a Grammy nomination for the album Raga Aberi. Shankar has performed on several of Peter Gabriel's records such as So and Us. Since 1996, Shankar has toured internationally with fellow-violinist (and his niece) Gingger as Shankar & Gingger, garnering critical acclaim and popularity. The two performed at events including the Concert for Global Harmony and Nelson Mandela's 80th birthday celebrations. Shankar & Gingger released their first DVD One in a Million in 2001. After a critically successful tour of North America, the DVD went to number 1 on the Neilsen Soundscan DVD charts and stayed there for four weeks. In 2004, Shankar composed additional music with Gingger Shankar for John Debney and performed on the score for the film The Passion of the Christ (2004). Shankar has played with some of the greatest musical contemporaries of his time, including Lou Reed, Echo & the Bunnymen, Talking Heads, Frank Zappa, Peter Gabriel, Elton John, Eric Clapton, Phil Collins, Charly Garc&iacute;a, Steve Vai and many more. Shankar has been praised for his ability to mix Eastern and Western influences, assimilating Carnatic music with pop, rock, jazz and contemporary world music. He admits "Ultimately, I would like to bring the East and West together. That, I think, is my role," he says. More recently, Shankar has used a new stage name, Shenkar, and has created recordings under this name. In 2006 ? 2007, Shenkar provided the vocals for the opening credit music and other themes for all episodes of the hit TV series Heroes. He has been lately working in Jonathan Davis', Stephen Day and Ana Maria Lombo's next records. See the detailed discography at Wikipedia.